NEB Express is an enhanced BL21 derivative available with (NEB #C3037) or without (NEB #C2523) the added control from lacIq. Within the realm of E. coli expression, the T7 system is the most popular approach for producing proteins. In this system, an expression vector containing a gene of interest cloned downstream of the T7 promoter is introduced into a T7 expression host. T7 expression hosts, such as DE3 strains or T7 Express strains, carry a chromosomal copy of the phage T7 RNA Polymerase gene, which is controlled by a lac promoter. When inducer is added, T7 RNA Polymerase is expressed and becomes dedicated to transcription of the gene of interest. T7 Express strains are available with the control features lacIq and/or lysY. The lysY gene expresses a variant T7 lysosome which naturally inhibits T7 RNA Polymerase, thereby controlling basal expression of the target gene. LysY is expressed from a single copy mini-F plasmid that does not require antibiotic selection for propagation. T7 Express lysY/Iq (NEB #C3013) provides the highest level of expression control. BL21(DE3) (NEB #C2527) is available for routine T7 expression and Lemo21(DE3) (NEB #C2528) is designed for tunable T7 expression of difficult targets such as membrane proteins, toxic proteins and proteins prone to insoluble expression. NiCo21(DE3) (NEB #C2529) has been engineered to improve the recovery of His-tagged proteins. 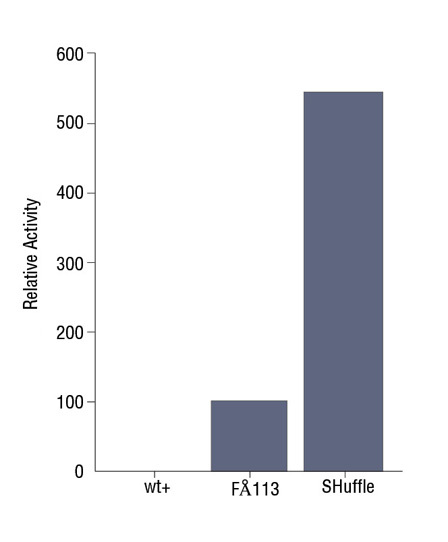 SHuffle® strains enable disulfide bond formation in the cytoplasm. Normally, reductases in the E. coli cytoplasm keep cysteines in their reduced form, thereby preventing disulfide bond formation in this compartment. The deletions of the genes for glutaredoxin reductase and thioredoxin reductase (Δgor ΔtrxB), allows disulfide bond formation in the cytoplasm with SHuffle. This combination of mutations is normally lethal, but the lethality is suppressed by a mutation in the peroxiredoxin enzyme (ahpC*). 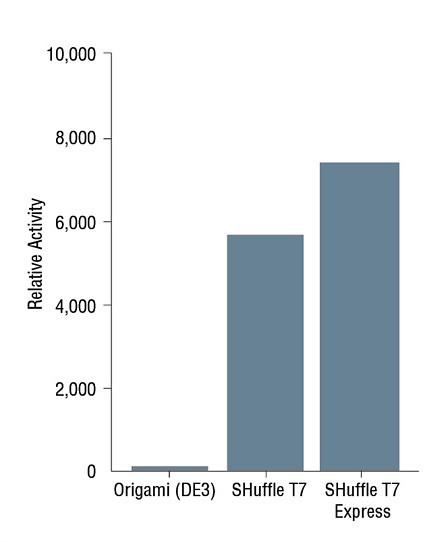 In addition, SHuffle expresses a version of the periplasmic disulfide bond isomerase, DsbC, which lacks its signal sequence, retaining it in the cytoplasm. This enzyme has been shown to act on proteins with multiple disulfide bonds, to correct mis-oxidized bonds and promote proper folding. 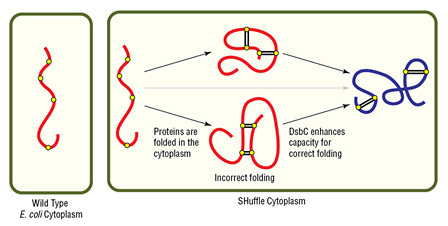 Disulfide bond formation in the cytoplasm of wild type E. coli is not favorable, while SHuffle® is capable of correctly folding proteins with multiple disulfide bonds in the cytoplasm. Plasmodium falciparum chitinase (PfCHT1) with three cysteines was expressed from a plasmid under the regulation of a T7 promoter. After induction cells were harvested and crude cell lysates were prepared. PfCHT1 was assayed using a chromogenic substrate (CalBioChem #474550) and standardized to protein concentration using Bradford reagent. Origami™ is a trademark of Invitrogen.